The third…issue arises when people cite religious or cultural values as a reason to violate or not to protect the human rights of LGBT citizens. This is not unlike the justification offered for violent practices towards women like honor killings, widow burning, or female genital mutilation. Some people still defend those practices as part of a cultural tradition. But violence toward women isn’t cultural; it’s criminal. Likewise with slavery, what was once justified as sanctioned by God is now properly reviled as an unconscionable violation of human rights. Secretary of State Hillary Clinton’s comprehensive, detailed and brave address on the importance of incorporating sexual orientation and gender identity (SOGI) issues fully into the international human rights framework is remarkable. It is one of the most important moments forward in the history of lesbian, gay, bisexual and transgender (LGBT) people in the US, and hopefully it will be a game-changing day for our sisters and brothers around the world. 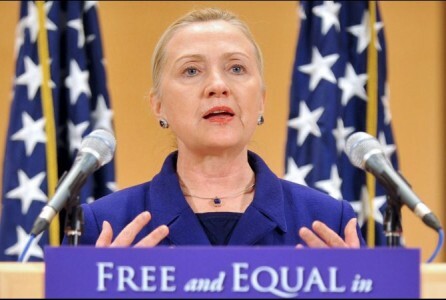 Not only were the analysis and policies announced by Secretary Clinton on December 6th, 2011 at the Human Rights Council meeting in Geneva, meaningful and helpful, they exceed the commitments the largest domestic (US) LGBT organizations have made thus far to the global sphere of activism. Ironically, this set of statements puts the US government on the record and engaged in supporting the human rights of LGBT people more specifically and with more money behind it than the level of support offered by the largest US based LGBT organizations. Indeed, the foundation for this incredible step forward was laid by a handful of LGBT and non-LGBT organizations (Council for Global Equality, IGLHRC, the Arcus Foundation, Open Society Foundations, Astraea and others who choose to remain anonymous), a core of individuals on the State Department and White House staffers (who know who they are, and who are too numerous to name without serious omissions), and supportive leaders (like Secretary Clinton, senior State Department officials and President Obama) all of whom have carefully and diligently worked on these issues for many years. Secretary Clinton’s speech is gorgeous and powerful (see the video link below, and transcripts are available as well from the State Department). 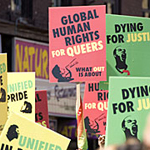 It puts the full force of the US government’s authority as an advocate for human rights behind the inclusion of SOGI in the global human rights framework. And it systematically takes apart the key arguments used to oppose the inclusion of SOGI into the human rights framework. The speech is noteworthy as well because it names the role that ideas of cultural tradition play in blocking LGBT human rights. The impact of tradition is indeed mixed as Secretary Clinton suggests, and I think the talk’s attempt to highlight progressive and inclusive roots to such traditions is important, and its frame that “it’s not cultural, it’s criminal” just so empowering for feminists to assert. However, I think it is at once optimistic and inaccurate to state that “rarely are cultural and religious traditions and teachings actually in conlfict with the protection of human rights.” Actually, religious leaders and institutional voices often position themselves in conflict with the expansion of human rights. And as the speech repeatedly cite, slavery has been justified by many religious traditions. Ultimately, it is social justice movements, like the women’s movements and the global SOGI movements that provide the inspiration, the courage and the muscle to change repressive cultural traditions around gender and sexual orientation. Secretary Clinton notes the vital need for allies and LGBT advocates to continue and press the struggle forward, “leadership by definition means being out in front of your people when it is called for.” This is a visionary address and it will hopefully signal the start of more resources and energy to help the amazing struggles that advocates and allies are waging on SOGI and human rights. Well, the way I see it is that yes, it’s a great, inspiring speech in its own right. Groundbreaking, no doubt. And someone has had it in their back pocket since Obama got elected, waiting for the right time to play that card, which is looking at re-election. This is the Obama administration saying “I can’t do anything about my own country, but I can do this for the UN.” But I think he can do something about his own country, it’s just safer to tell the rest of the world how to act, which is typical American arrogance. But that’s just me. Is this the same Hillary Clinton that is practically the spokeswoman for Lockheed-Martin? I’m sure all of those Afghan, Iraqi, Pakistani, Somalian, Yemeni, Libyan, Ugandans and Iranians surely feel the same way about their “human rights”…..
Watch what she *does*, not what she *says*.